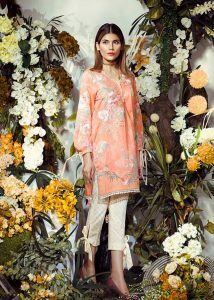 Ethnic by Outfitters brought it’s festive ready to wear collection that vibrant and colourful along with luxury pret that you could flaunt on any occasion. And with that, we had yet another styling job. We had a great time and a dream team to work with on the ready-to-wear festive collection 2017. Shot with the suave Amna Baber who can nail any look, hair and makeup by Noman and photography was done by Stop Style. We had 21 looks for Amna who carried each look with grace and sophistication. Her outfits were complimented by jewels by Zarq, Sonar by Syma Raza and Pencil & Bullet Earrings by Allure by MHT. Besides summer wear, there were luxury pret wear pieces that could be donned for semi formal occassions and we supported each look with a side swept sleek pony and blow dried waves.